Its no secret that marble is one of my favorite elements. I am always on the lookout for new marble additions to my home like beautiful trays and boxes, table tops & accents, so why not add a little marble to my wardrobe as well ? …and voila, Cluse has me covered! 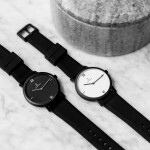 Both a statement and a staple, Cluse La Roche Watch Collection feature black & white genuine marble dials, produced from raw stone, making every watch face different with its own unique veining pattern. It’s this nod to uniqueness, while still being rooted in simplicity and minimalism, why I am a fan of these time pieces. I got my watch when they first came out a few months ago, they sold out almost immediately, but I’m happy to say they are finally back in stock !! The flatlay and composition of the shots in this post, is absolutely stunning! Marble is fast becoming one of my favourite elements too!